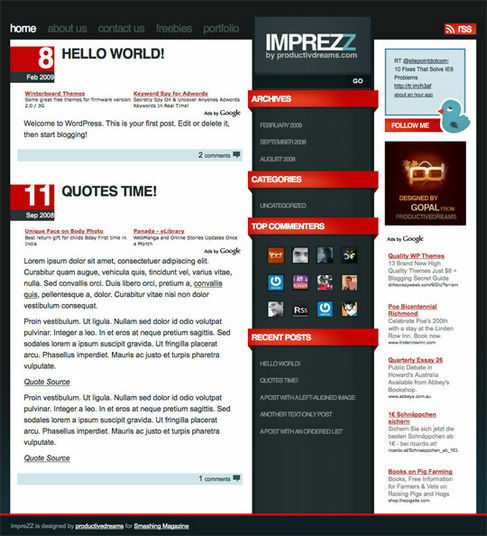 Free WordPress Theme – Imprezz | WordPress Theme | All Free Web Resources for Designer - Web Design Hot! Smashing Magazine released Imprezz – a simple and beautiful 3-column-theme, a free wordPress theme designed by Gopal Raju from ProductiveDreams. The theme can be used in various setting for various purposes – in magazine-blogs, but also in corporate and private blogs. The theme supports WordPress 2.7.1 and works well with the zdcomments widget (which is used to display the top commenters). The package also include the PSD-source file of the logo. This entry was posted on Wednesday, December 16th, 2009 at 8:34 pm and is filed under WordPress Theme . You can follow any responses to this entry through the RSS 2.0 feed. You can leave a response, or trackback from your own site. this is great work, do you mind if I share this?